← Orbital ATK SLS Booster Test Tuesday! Image credit & copyright: Ivan Eder. 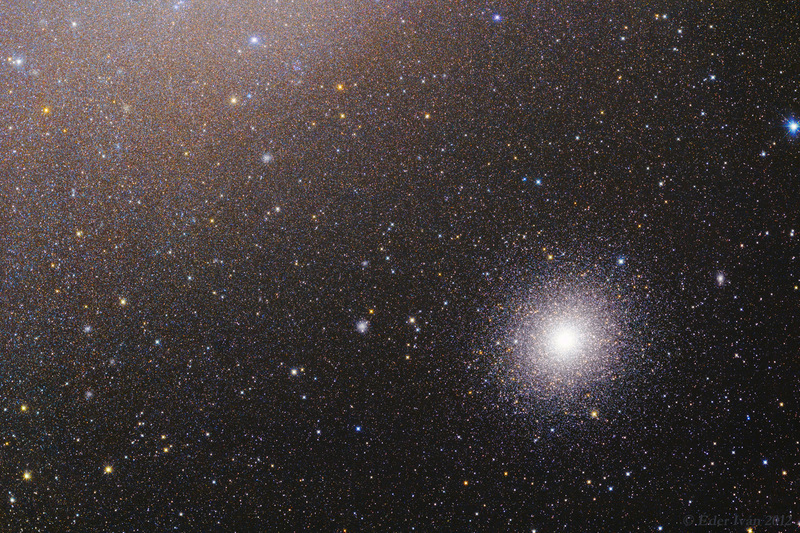 Seemingly awash in a shower of stars, southern globular star cluster 47 Tuc has been labeled as the “Jewel of the Southern Sky” and for good reason. With an apparent magnitude of 4.9 this cluster is easily visible without visual aid and is second only to the great Omega Centauri in size and brightness. In dark skies this 120 light year diameter mass of a few million stars can be as large as the full moon on the night sky. That shower of stars at upper left in this image is the outskirts of another southern treat, one of the Milky Way’s two major satellite galaxies, the Small Magellanic Cloud (SMC). The SMC at a distance of 210,000 light years is much further away though it helps make for an incredible view. The Milky Way boasts at least a couple hundred globular star clusters, almost all of which reside in the halo above and below the galactic plane but if you expand this image and look beyond 47 Tuc, you can see that the SMC has numerous globular and open star clusters of its own. What Are Globular Star Clusters? Globular star clusters get their names from their characteristics as nearly spherical groups of stars. They’re masses of a few hundred thousand to a few million mainly ancient stars that live almost exclusively above and below the plane of the Milky Way. They’re not confined to the Milky Way however because both of the Milky Way’s major satellite galaxies, the Large & Small Magellanic Clouds (LMC & SMC) are littered with them and we can also see them in other galaxies such as M31 the Andromeda Galaxy as well, so they appear to be pretty common in the universe. Generally speaking, globular clusters are extremely old with the youngest in the Milky Way being about 10 billion years old and it’s believed that they formed at roughly the same time as the Milky Way and in close proximity to one another which is what caused them to gravitationally attract and form the tight masses that we admire nightly. Like planets and major solar system bodies once the mass becomes large enough, it just pulls itself up into an almost sphere-like shape though hydrostatic equilibrium. Also like the material of major solar system bodies, there’s a sorting mechanism (gravity) at work here. The most-dense stars migrate inward to live in the core while the lower mass inhabitants sort accordingly from downtown to the rural outer reaches. Because of their age, stars within globulars are very metal poor and there are many examples of exotic stars such as neutron stars and pulsars of different classifications in globular clusters they seem to lack planets. As we search our neighborhood we see planets everywhere but that hasn’t been the case for globulars in the few times that we’ve searched. Perhaps they are there but due to the fact that they are so far away we’re not able to effectively detect them yet. Or perhaps it’s because stars living in globulars lack heavy elements making planet formation less likely to occur to begin with. To date, only a few planets have been found in a globular star cluster. PSR B1620-26b is a 13 billion year-old 2.5 Jupiter mass planet in the closest globular star cluster to Earth, M4 in Scorpius and it orbits a binary white dwarf and neutron star. If you allow your imagination to run wild a little here, can you imagine what a nearly 13 billion year old life form would be like?! Our entire solar system is only about 13.4 billion years old. Though the globular kings, Omega Centauri and 47 Tuc reside in the Southern Hemisphere there are still many remarkable ones to observe in the Northern Hemisphere as well such as M13 in Hercules which is where the famous Arecibo Message was beamed toward on November 16, 1974. 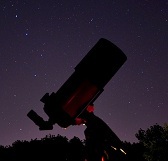 Some other Northern Hemisphere greats are M3 in Canes Venatici, M5 in Serpens and M92 in Hercules. Wherever you are, go give them a look. NAME: 47 Tucanae, 47 Tuc, NGC 104. WHAT IS IT? : Globular star cluster. HOW FAR AWAY IS IT? : 13,000 light years. HOW BIG IS IT? : 120 light years in diameter, containing millions of stars. APPARENT MAGNITUDE: 4.9 and the second brightest globular cluster after Omega Centauri. WHERE IS IT? (General): Constellation Tucana. WHERE IS IT? (Exact RA/Dec J2000): RA 00h 24m 05.67s / Dec –72° 04′ 52.6″. Image | This entry was posted in Astronomy (Learning), Astrophotography (DSOs), Images, Star Clusters (Globular-Open) and tagged 47 Tuc, 47Tuc, Astronomy, Astrophotography, DanSpace77, Globular Cluster, Globular Star Cluster, Ivan Eder, Space, Star Cluster, Tucana. Bookmark the permalink.